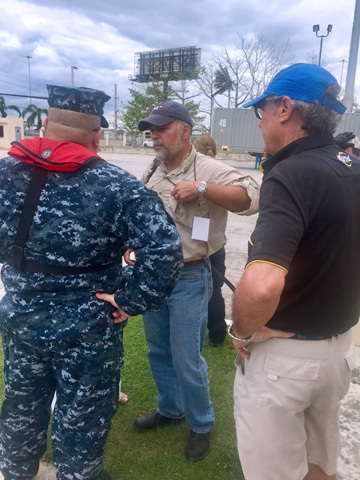 Miguel A. Soto-Class, president of CNE (center) participates in the relief effort. The Center for a New Economy, through its recently created Puerto Rico Recovery Fund has established a network of 10 distribution centers islandwide to quickly distribute the emergency supplies the entity has collected and will continue to collect in the island and the mainland United States for communities devastated by Hurricane Maria. The PRRF received 120,000 pounds of water donated by the State of New York and transported to Puerto Rico in a UPS flight. The water is being distributed through the centers the PRRF has jointly established with seven local nonprofit organizations throughout the island in Isabela, San Juan, Cabo Rojo, Mayagüez, Guaynabo, Toa Baja, Humacao and Adjuntas. The PRRF has also collected and distributed more than 50,000 pounds of food and medicines to affected communities in Vieques, Aguadilla, Humacao and San Juan. “The magnitude of the suffering and devastation we have seen in communities throughout the island is immense,” said Miguel A. Soto-Class, president of CNE. “This is why the PRRF is mobilizing resources in Puerto Rico and the United States to distribute supplies among the victims of the disaster quickly, within 24 hours of their receipt in the island,” said Soto-Class, who has personally participated in the distribution of the supplies through helicopter deliveries and air lifts due to the bad state of the island’s roads and the lack of access to many remote communities. “CNE created the Puerto Rico Recovery Fund to address the most immediate needs of the people affected by Hurricane María. At the same time, once we are past the emergency, both the PRRF and CNE will contribute to the reconstruction of Puerto Rico in the mid and long term,” said Soto-Class. Through its offices in San Juan and Washington DC, CNE will continue to be a strong voice and persuasive advocate in the United States capital on behalf of Puerto Rico’s reconstruction and recovery efforts. The entity will focus its efforts in the mainland in advocating for robust federal assistance and a comprehensive recovery and reconstruction program for Puerto Rico. Stateside and island entities that have joined CNE’s PRRF through donations, supplies, logistics, storage and distribution support are: the Baton Rouge Area Foundation, the State of New York, the New York Community Trust, Unicef, UPS, Allen & Company, B. Fernández & Hnos. Inc., V. Suarez & Company, Inc., and Plaza Provision Company. The local nonprofits that have joined CNE and its affiliate Espacios Abiertos (EA) to establish the PRRF’s distribution centers throughout the island are: the Boys and Girls Clubs, the Instituto Nueva Escuela, PECES, Casa Pueblo, Para la Naturaleza, Sacred Heart University and the Baptist Church of Puerto Rico. Hey Buddy!, I found this information for you: "CNE distributes water, food, emergency supplies in PR". Here is the website link: https://newsismybusiness.com/distributes-emergency-supplies/. Thank you.